Doctors found a dangerous aneurysm in Kerri Evensen during routine tests. A Wisconsin woman hoping to save the life of her son by becoming a living donor instead saved her own life because of routine testing for the planned donation. 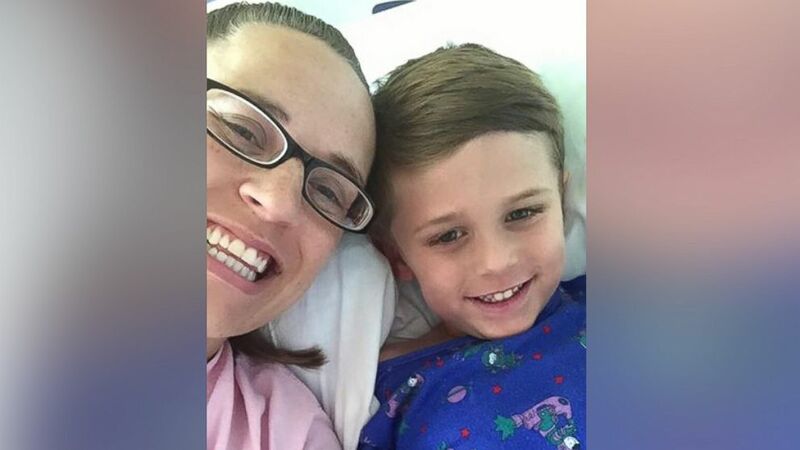 Kerri Evensen was undergoing an MRI as part of a battery of tests to see whether she could donate a portion of her liver to 4-year-old son Auden, according to her husband, Tom Evensen. During the test, Evensen's doctors found a dangerous anomaly, an aneurysm located near her kidney. An aneurysm occurs when a blood vessel balloons because of a weakness in the vessel. She had no symptoms, Tom Evensen said. "It was to the point if we did go through and have another child ... the aneurysm could have burst and could have been severely life-threatening," he told ABC News. The aneurysm was treated via surgery, freeing Kerri Evensen to be considered again for the liver donation. “I know I would never had done any other test to find this aneurysm in time,” Kerri Evensen told ABC affiliate WKOW-TV in Madison. “So he absolutely 100 percent saved my life, by checking ... to save his life." (Tom Evensen) Kerri Evensen poses with her son Auden in the hospital. The boy was diagnosed with a rare liver condition called alpha 1 antitrypsin deficiency, where his liver fails to make a key enzyme. As a result, he has difficulty controlling his blood-sugar. His liver and spleen are enlarged and the rambunctious toddler can only play with his three siblings for a few minutes before becoming overheated, sparking a fever. "All of the ailments that Auden is currently dealing with will be removed once the transplant is complete," Tom Evensen told ABC News. He said they expect Auden and Kerri Evensen to be well enough to undergo the liver transplant later this year. The family is now counting down the days to the expected transplant. "You wait almost five years [for the transplant]; to finally put a date on it is really exciting," he said. "We’re really exciting to start this new chapter of our life."